Over the past year or so, several websites that provided forums for getting questions answered have closed. Many questions about silver were answered at these sites and users now have a hard time finding a source for answers. So, I'll try to answer your questions if I can. The format of this blog is not designed to be easily used for that purpose but we'll make do until something better comes along. Just post a comment to an existing post. You will not see it added to the post immediately because I moderate all comments. I'll receive an email notification and if your comment is appropriate, I'll allow it to be added and I'll try to answer your question. If you run across another good Q&A site, let me know by posting a comment. I'm not an economist and I'm not an expert on trading in precious metals on the commodity market. But I do buy and sell sterling silver pieces so I watch external market forces that impact my business. A general rule I believe in is that as the rate of inflation grows, the price of precious metals may rise as buyers try to develop a hedge against inflation. Right now in Europe, central bankers and economists are worried about deflation. Even though the United States is in a different financial position from Europe, it is affected by world events. So, to my way of thinking, prices for precious metals will not rise significantly as long as deflation is a worry. Of course, some significant world event like a war could change things but if that does not happen, the world price of silver might be stagnant for a while. Prices of precious metals did bump up a bit this morning in response to actions taken by European central bankers but similar actions in the recent past have not had a huge impact. So, the silver market may just drift sideways more or less until this situation sorts itself out through natural market mechanisms. 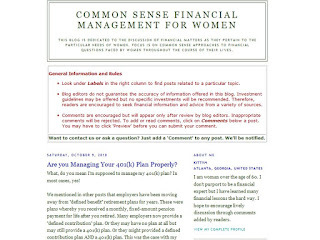 NOTE: This is the text of an article I wrote for Examiner.com that might be useful to blog readers. A blog reader purchased this item on eBay. 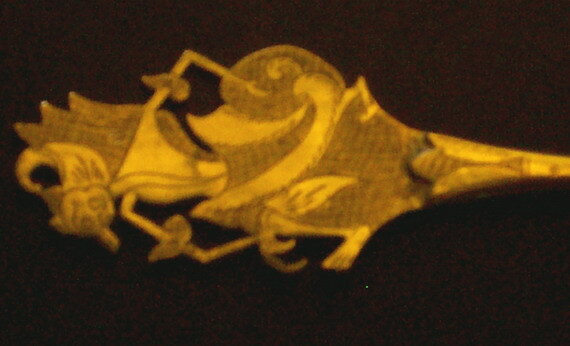 It's from Walker & Hall and is just under 5 inches long. The seller said it was a sardine server. 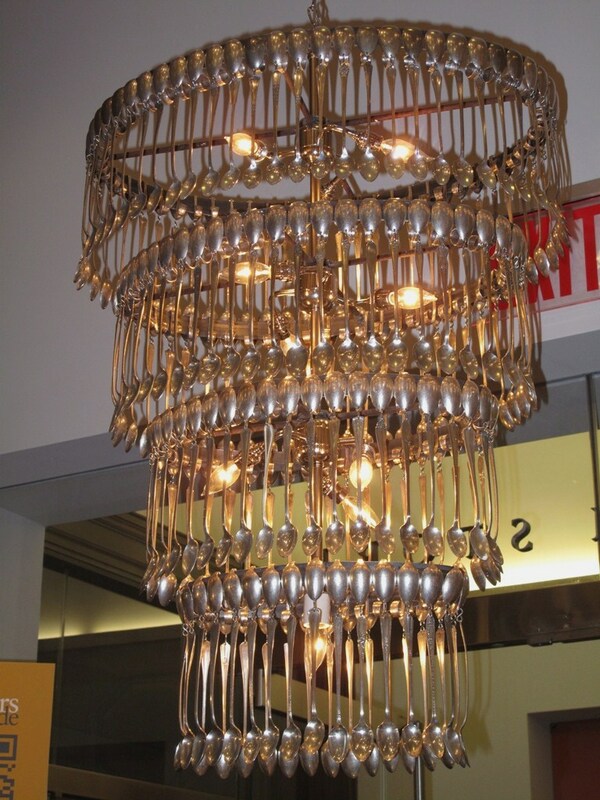 The buyer wonders if this truly is a sardine server. You can't tell from the picture but the bowl slants downward. Normally, a serving piece is designed to be used with the pattern facing up. For this piece, the angle of the bowl with respect to the pattern does not make sense for a sardine server. If you have any ideas, post a comment. 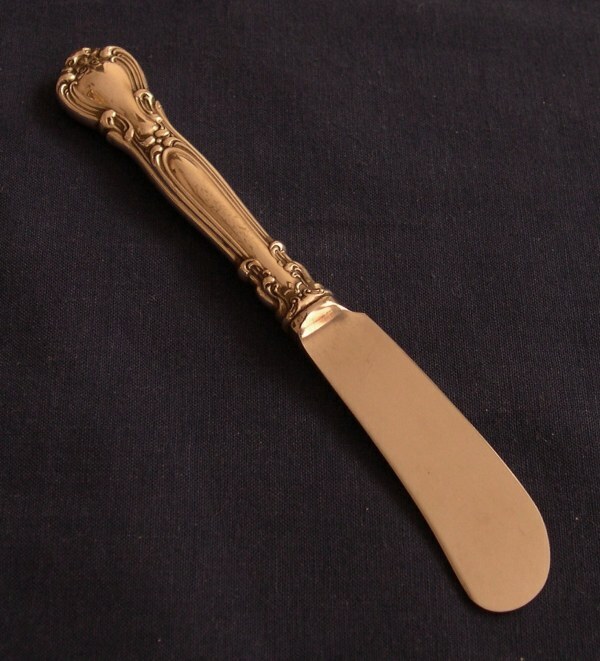 For some reason, I've received a number of questions lately regarding Holmes & Edwards Inlaid Silver. Here's an article I wrote that should answer most questions. If it does not, leave a comment or send an email to me. About three days after writing the first article, I acquired a set of Westmorland Milburn Rose that included some interesting information about Westmorland during wartime. So, I wrote the second article while it was on my mind. If there are any topics you would like to have added to this blog, feel free to email me at GeorgiaSilver@bellsouth.net. 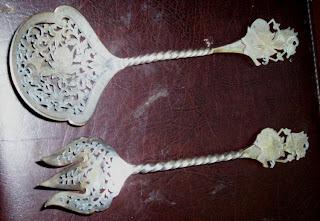 A blog reader has asked for help in locating anyone who wants to sell some "Princess Ingrid" by Frank Whiting. 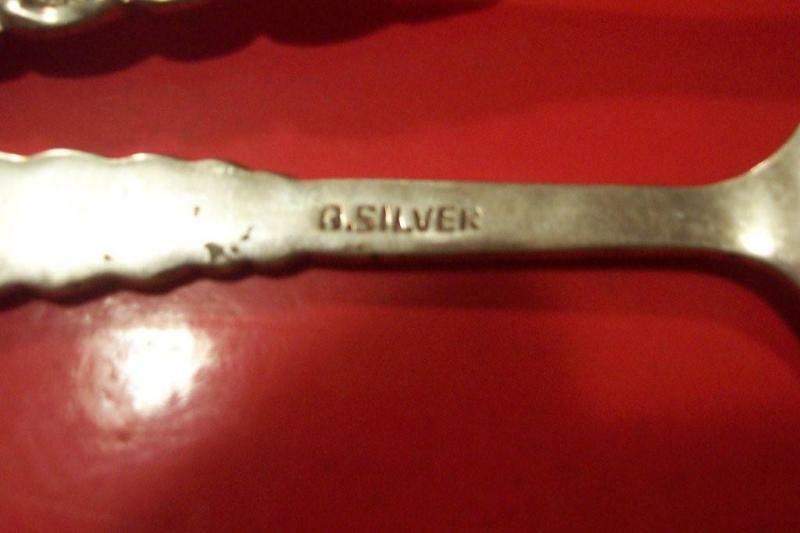 If you fit this mold, click on "Email Silver Jim" in the right column and send us an email. A blog reader has asked for assistance in locating some specific pieces. 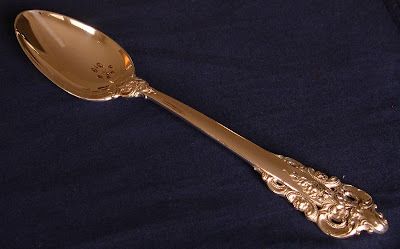 Her great-grandmother gave away some pieces of Gorham Buttercup engraved on the back with "O S Merry". The picture gives an idea of what we're talking about. If you know of the location of pieces like this, send us an email. We know this is a shot in the dark but we can't locate these pieces if we don't try! 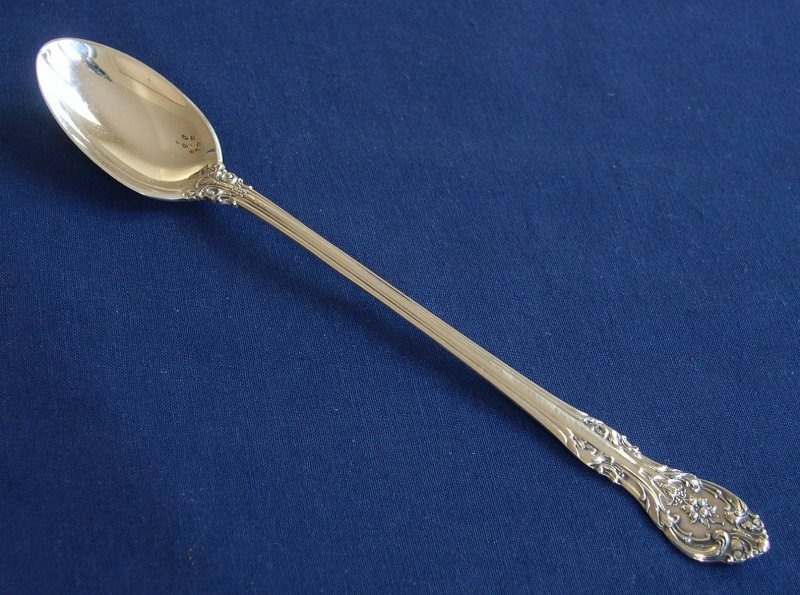 Why can't I sell my sterling silver for higher than scrap value? Why can't I sell my sterling for higher than scrap value? As a reminder, we don't think folks should ever sell their sterling unless they really need the money. In general, the price received will always be disappointing, especially if the seller expected to get somewhere close to retail or close to the prices charged by companies like Replacements, Ltd. We think the value of sterling as a personal family heirloom is much greater that its value on the used market and it should be handed down through generations. If you must sell, be patient. Get offers from several buyers and try to find the buyer who wants sterling for personal use. Such a buyer often is willing to pay more. This has nothing to do with silver! 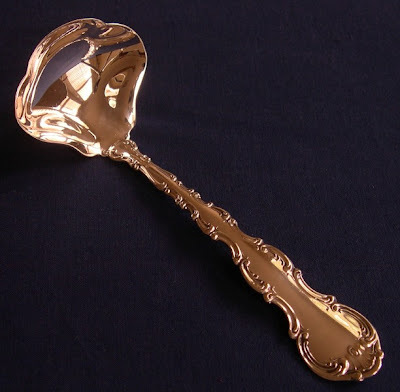 This post has nothing to do with silver but maybe the topics might interest a few readers. I'm returning a favor to sources who have linked to me from their web sites. I wrote this article on May 22, 2011. So far, it is Number One on the Hit Parade of articles! It received 600% more "hits" on the first day than the next most popular article I ever wrote. I've been wrong many times in my life and this is one of those times. I just did not think the spot price of commodity silver would continue to climb as it has. Aside from one unusual circumstance around 1980, silver has never been this high before. As I'm writing this, it's at $34.25 per Troy ounce, an increase of 108% over the price a year ago of $16.46. This is all well and good for investors in commodity silver. 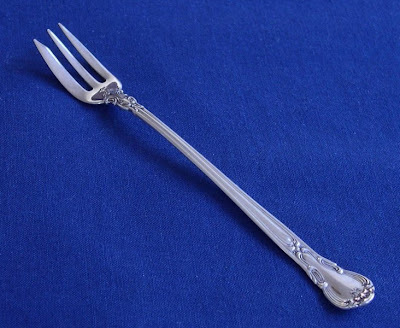 However, it's having a tragic side effect on sterling flatware and hollowware. It's now often more profitable to sell used pieces to be melted down than to sell them for what they were intended. The result is that there will be a dearth of pieces out there in the market for some discontinued patterns. We are not big fans of melting beautiful sterling pieces just to recover the silver. But we do realize that there are valid reasons to proceed with this process for some pieces. For example, your garbage desposal may have grabbed a spoon! A problem for the average consumer is finding a buyer who will pay a decent price for the sterling to be melted. Because of the currently high price of silver, we have decided to offer a service to blog readers who are having a hard time finding such a buyer. We have established a relationship with a local metals refiner who pays us a decent percentage of the value of the recovered silver. If you would like to have us take your scrap silver to this refiner on your behalf, click on 'Email Silver Jim' in the right column to send us an email. Tell us your name, address, contact number and a brief description of what you have. We'll email you a simple contract, terms and conditions and a description of what to expect from this process. 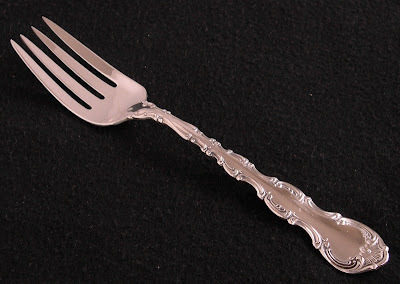 This post has nothing whatever to do with silver. However, I would like to ask a favor from blog readers. 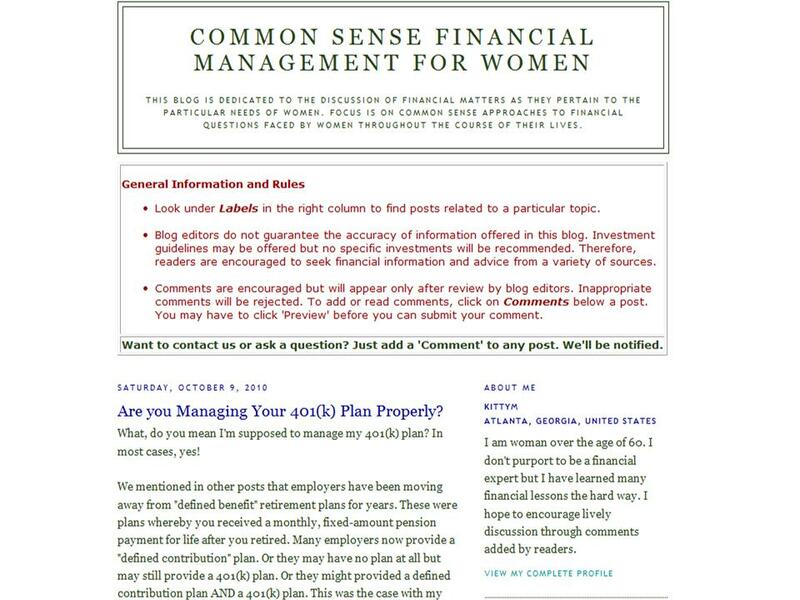 I am helping a friend launch a new blog, Common Sense Financial Management for Women. I have actually ghost written a couple of articles for her. We are now in the testing phase and need traffic to the site from places around the country (and world) in order to test activity reporting and to show Google search engines that there is some interest. 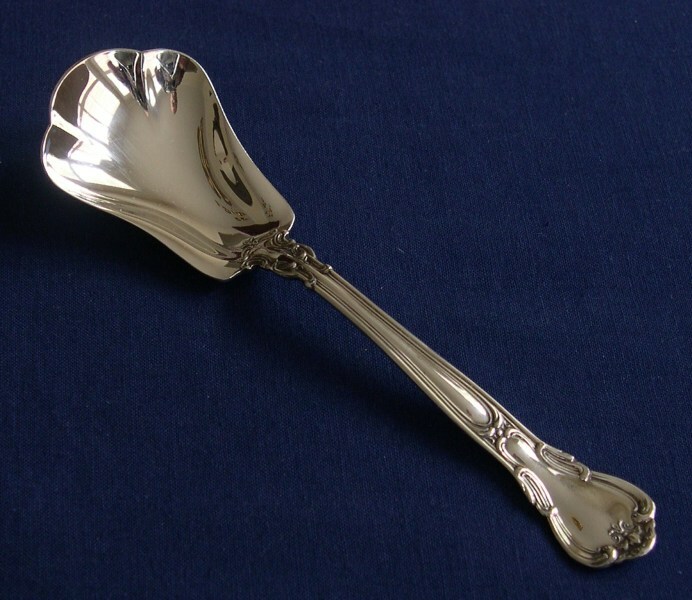 If you have received benefit from posts on Silver Chatter, I'd appreciate a return favor. Just click on the link above. I promise there is no maliciousness involved here! 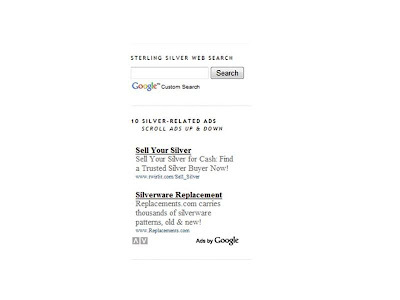 Once you get there, if you see a Google ad that interests you, click on it. If the blog interests you, feel free to leave comments to be attached to any post. 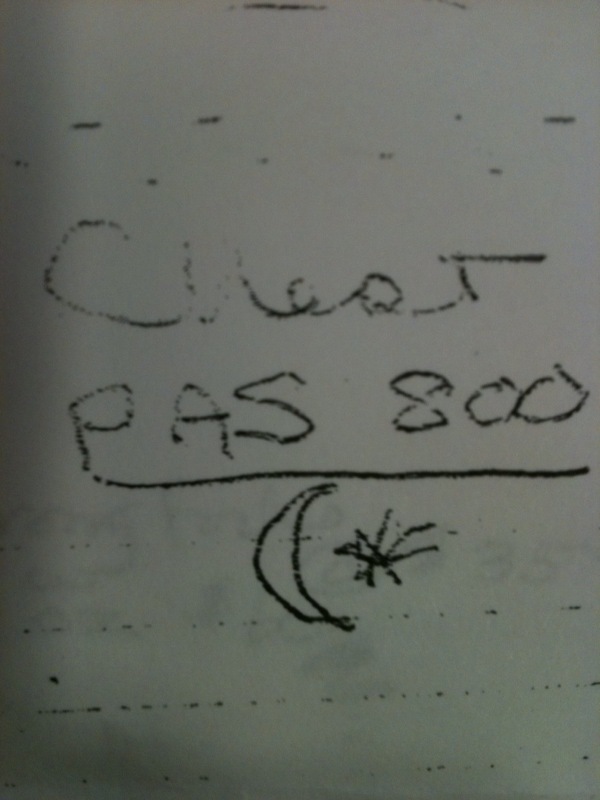 I received a question on my AllExperts site today that stumped me. 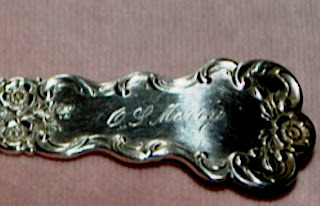 The question regarded a set of Gorham sterling flatware identified on the back of the pieces as "Pattern M". 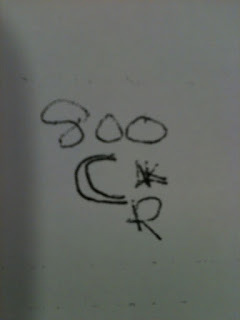 The questioner included a picture of a few pieces and they looked like Gorham/Durgin Fairfax. I've attached my own picture of a Fairfax piece below. I would like to hear from anyone who might be familiar with the terminology, "Pattern M". Email me or add a comment below. Why has posting to Silver Chatter slowed down? I've received a few emails from readers wanting to know what's happened to me? I appreciate the interest and should explain why posts have been so few lately. The latter two have been taking so much of my spare time that I've been remiss in posting to this blog. All three sites are getting a decent amount of traffic each day. During the week, the combined daily "hits" on all three sites is somewhere around 350. On Friday, Saturday and Sunday, the number sometimes jumps close to 500 per day. A lot of people are interested in silver, it seems! Thanks to all regular readers and keep clicking those Google ads - I need money for Starbucks! Most of the ads relate to the content of this blog. Google does a pretty good job of analyzing the content of the posts and displaying ads that might be of interest to people interested in the content. A few oddball ads show up now and then but most relate to silver (or gold) somehow. 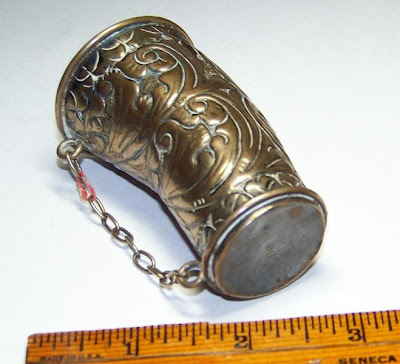 So, the ads provide a service to readers interested in selling or buying silver or locating such things as silver polish. We receive money when you click on an ad. Generally, the amount is very small per click but it adds up to pay for a cappuccino now and then! We've discussed in the past the fact that rubber can damage silver. Unfortunately, the word has not gotten out to everyone. 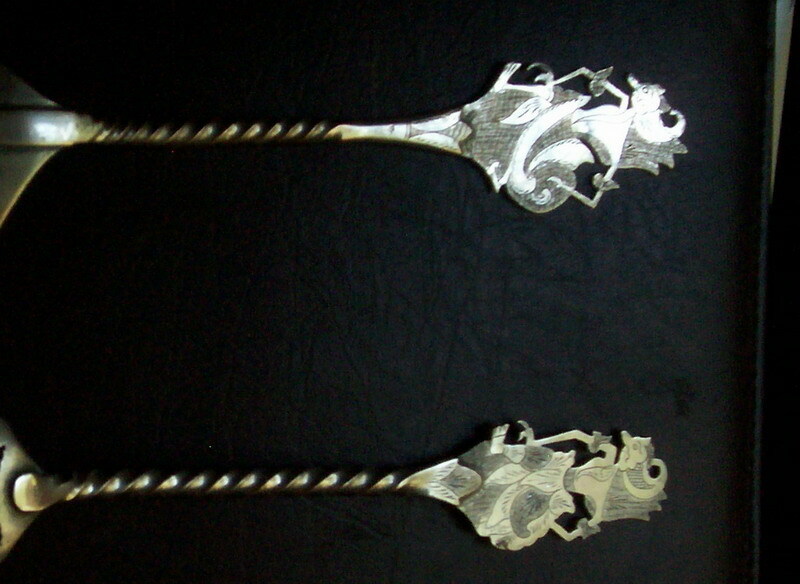 Yesterday, we received some Wallace Rose Point dinner knives that we had purchased by mail. The knives were in "like new" condition EXCEPT for the fact that someone had wrapped them in rubber bands that damaged the handles! Something like this that violates proper care methods for sterling really sets me off and I just had to post this article as a reminder. 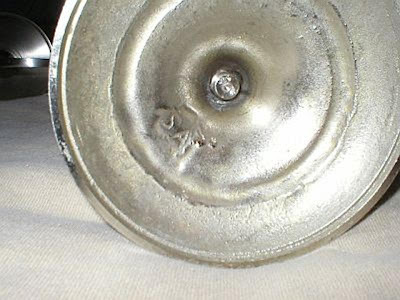 Rubber can damage silver! 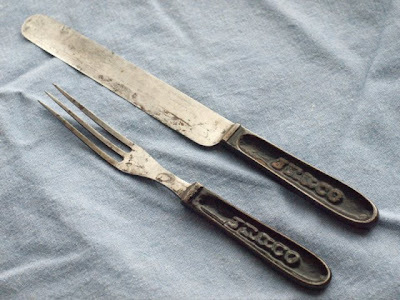 We recommend that rubber gloves not be used when cleaning silver. And definitely, rubber should not be stored anywhere near silver. Now this is a subject about which we know very little. But that's not stopped us in the past! Because we receive so many questions on this subject, we've gathered a few web sites that might provide some information. Here's a link to our article with these references: www.examiner.com/x-26031-Sterling-Silver-Examiner~y2010m5d9-Souvenir-Spoons . In the article you will find links to the earlier two articles. The focus is on sterling but the discussion could apply to silver plate as well. 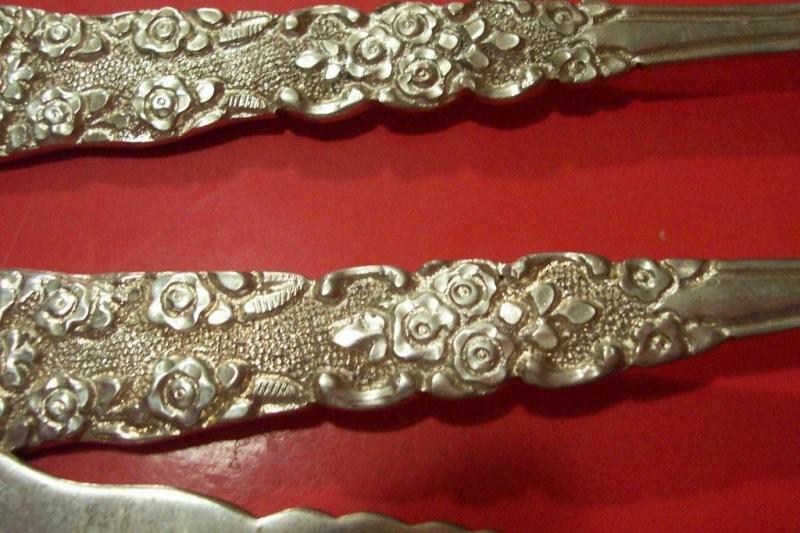 Copies of popular sterling flatware patterns such as Chantilly and Old Maryland Engraved are being offered on eBay. I ran across some listings on eBay today for sterling flatware pieces in various patterns. The pieces are advertised as "new". The titles of the listings imply that they are pieces manufactured by the original manufacturers. 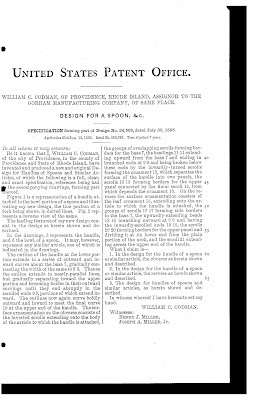 When you read the detailed descriptions, you see that the listed pieces might actually be only similar to the original patterns mentioned in the title. In other words, they are copies. I think the listings are VERY misleading. If you have any doubts, send a question to the seller making sure that you understand what is being offered. Feel free to send me questions via email as well. 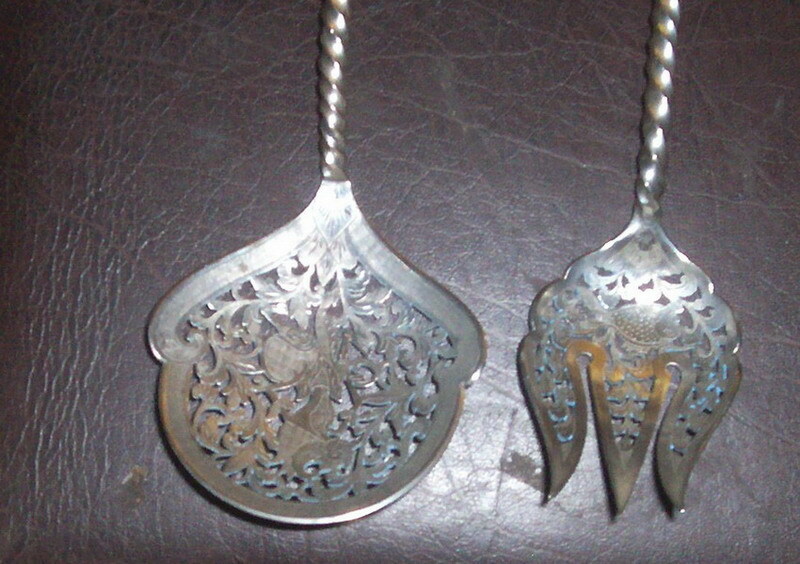 We don't deal much with silver plate pieces but we receive an awful lot of questions about them. One thing that's confusing to many questioners is the plethora of confusing marks one finds on various silver plate pieces. So, here's a list of clues. If you see one or more of these designations on your piece, it may very well be silver plate. We receive many, many inquiries from readers interested in selling their sterling flatware and hollowware. 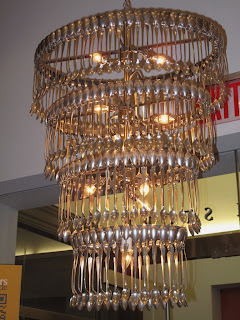 Although we encourage them to try to find buyers who will appreciate their pieces for their utility and beauty, sometimes the best route appears just to sell it for scrap. For these buyers, the marketplace is very confusing. Prices paid for scrap sterling vary widely. So, as a service to our readers, we would like to provide a list of potential scrap buyers along with information about the buyers and what they might pay for scrap sterling. We prefer a flexible formula that refers to the current day's price of commodity silver, whatever that may be. That way, your price can fluctuate as the silver price fluctuates. We'll convert the formula you provide to a standard one we will use to compare all sellers. Price per gram of pure sterling you paid on a specific date in recent history. Tell us what the closing price of silver was on that day. Price range per gram of pure sterling you have paid in recent history. Tell us the dates of the range. We'll prepare your information into our standard format and email it back to you for your approval. Then, whenever anyone asks us to provide a list of potential scrap buyers, we'll provide the information of all the buyers we have received to to questioner via email. We promise not to publish the information in any other form. Of course, we have no control over the what the people we send it to will do. Scrap buyers may update their information with us at any time. We will not provide the names of potential sellers to buyers. The service we will provide is simply an attempt to bring a potential buyer and seller together. We make no claims of accuracy regarding the information we provide to anyone. In no way are we to be party to any transaction or contract that may result. We are not acting as agents for anyone and we are not seeking, nor do we expect to receive, any compensation for this service. Buyers and sellers assume all responsibility for any transaction resulting from the information we provide and they understand that we will not be held liable for anything. We reserve the right to include, or not include, buyers on our list solely at our discretion and for whatever reason we may choose. 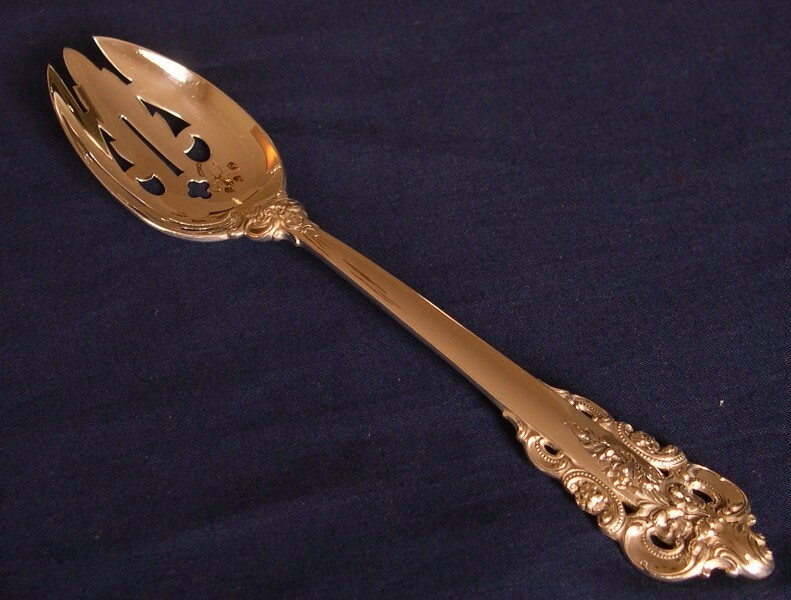 What's the value of my silver plate flatware? A blog reader has submitted these pictures of a piece to seek help with identifying it. It has the number, "800", on the bottom. You can see the length in the pictures. 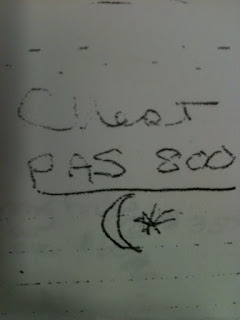 If you have some idea of what is is, send us an email or post a comment. 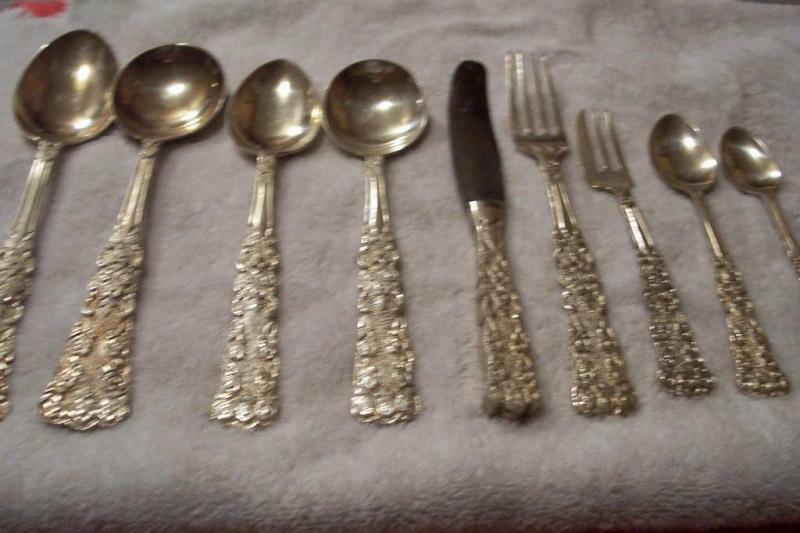 We receive comments such as this frequently, "My sterling flatware set must be worth $XYZ.00 because I've seen it listed on eBay for this amount." Listing on eBay and actually selling are two different things. On many eBay screens, you will see a link to "Advanced Search". Click on this. Check the box that says, "Completed listings". Check the box that says, "Include Store inventory". You will see a list of completed listings in the past two weeks that met your keyword criteria. The listings you will want to examine are those that have a little box with the word "Sold" beside them. Review these specific listings to see what was being sold and compare them with what you are considering selling. Examine the selling price. This will help you determine the true value of your set, at least on eBay. We receive so many questions about Rogers flatware that we wrote an article about the subject for Examiner.com. If you have questions on this topic, we suggest reading the article first. I remember reading somewhere that the US government limited the number of pieces that could be made in any pattern. I believe I remember reading this was after the Victorian era because they created so many pieces. Is this true and if so what did they limit the number to? No one in our group is aware of this. Can anyone out there help? Send an email or post a comment. 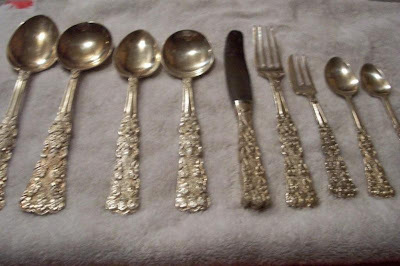 We have been asked if we know anything about the flatware in the pictures. It's from Greece. The original owner lived in Greece many years ago. We have no knowledge about this but if anyone out there knows anything about it, please post a comment or send us an email. 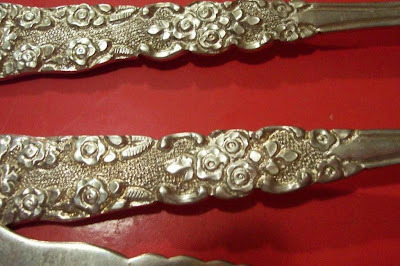 For example, we would like to know pattern name, silver content, manufacturer, definition of the hallmark or anything else that will help the blog reader know more about this set. After watching the YouTube video in the previous post, we decided to investigate the inside of a knife handle on our own. 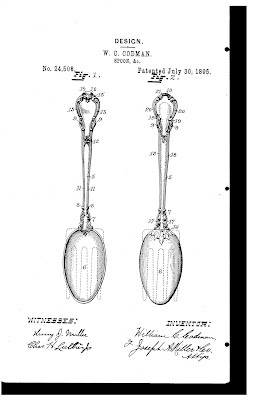 In the first picture is a fairly old Gorham Chantilly knife. We estimate that this knife is between 60 and 80 years old but that's just a guess. There was a crack in the blade so we didn't mind ripping it apart to see what was inside. 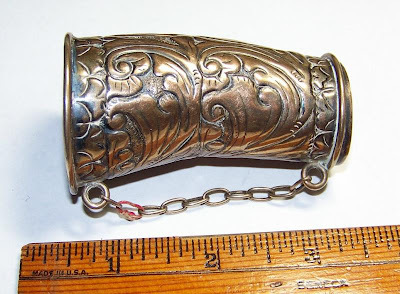 In the second and third pictures, you can see where we have peeled the sterling outer casing of the handle back a bit. You can see the round shaft of the blade embedded in epoxy inside the handle. We have knocked a bit of the epoxy away at this point. The third and fourth pictures show the sterling casing with roughly half the epoxy removed. In the fourth picture, you can see a bit of the remaining epoxy in the lower portion of the handle. The final picture shows the knife blade with the round extension normally embedded in epoxy. You can see indentations probably designed to help it grip the epoxy. There is a bit of epoxy laying beside the blade. This was taken from the tip of the handle. You can just make out some of the Chantilly design in the epoxy. We weighed the sterling we removed from the knife. It was roughly 30% of the weight of the original knife. We don't know if that's a good working estimate for all such knives because construction techniques may differ. We ran across this YouTube video recently. 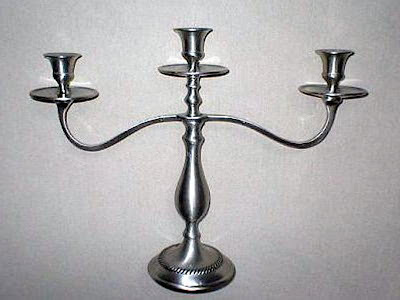 It illustrates the construction of hollow handle sterling flatware and weighted candlesticks. It's not great quality but watch and listen carefully - you'll understand the basics. It's worth watching. We have to say that most of the information presented there duplicates what you will find on this blog. We are trying to find new readers through Examiner.com but wanted blog readers to know about it. About once a week we receive some variation of the questions, "Is commodity silver a good investment?" and "Where is the price of silver headed?" Although we track the price of commodity silver because of a general interest, we really do not have enough knowledge about the subject to offer any advice. We did discover this article on Wikipedia that gives some facts on the subject (primarily history): Silver as an Investment. I do know that owning any precious metal can be cumbersome. If I was going to play in the commodity silver market, I would probably look at buying stock in silver mines or perhaps one of the Exchange Traded Funds (ETF) that focus on owning silver. This comment should not be considered as financial advice. Talk to experts and read everything you can about precious metal investing before jumping in.